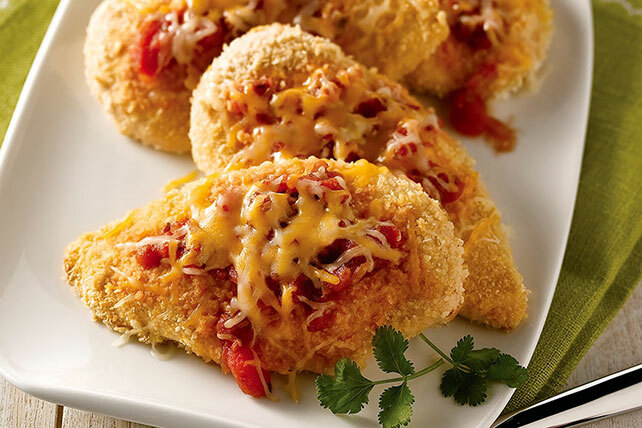 This chicken breast dish boasts four kinds of melty cheese, salsa and a perfectly crispy crust, thanks to crushed crackers. Dip chicken in egg then in cracker crumbs, turning to evenly coat both sides of each breast with each ingredient. Place in 13x9-inch baking dish sprayed with cooking spray; drizzle with butter. Bake 20 min. or until chicken is done (165ºF). Top with salsa and cheese; bake 5 min. or until cheese is melted. Serve this tasty chicken dish with hot cooked rice, and a crisp green salad tossed with your favorite KRAFT Lite Dressing.